New York Times bestselling author Laura Lippman returns with a superb novel of psychological suspense about a pair of lovers with the best intentions and the worst luck: two people locked in a passionate yet uncompromising game of cat and mouse. But instead of rules, this game has dark secrets, forbidden desires, inevitable betrayals and cold-blooded murder. They meet at a local tavern in the small town of Belleville, Delaware. Polly is set on heading west. Adam says he’s also passing through. Yet she stays and he stays drawn to this mysterious redhead whose quiet stillness both unnerves and excites him. Over the course of a punishing summer, Polly and Adam abandon themselves to a steamy, inexorable affair. Still, each holds something back from the other dangerous, even lethal, secrets. Then someone dies. Was it an accident, or part of a plan? By now, Adam and Polly are so ensnared in each others lives and lies that neither one knows how to get away or even if they want to. Is their love strong enough to withstand the truth, or will it ultimately destroy them? Something or someone has to give. Most of you know I’m an avid crime fiction reader, it’s my go to genre so I’m slightly ashamed to say this was my first Laura Lippman book! Looking through her back catalogue I can see she writes exactly the kind of books I love so I have NO idea how she’s been off my radar thus far. 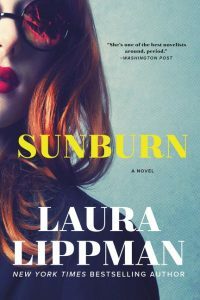 I’ve seen many others say that Sunburn is not typical for her, but I loved it and her writing is so nuanced, so dang good that I won’t be missing out on her books in the future. Polly is a mysterious woman with a plethora of secrets in her past, you know little about her for a long time, Lippman methodically peels back the layers of her character until you get to the core. Adam also has a mysterious past and the same goes for him, you slowly but surely gain information about his history and you’re just never totally comfortable trusting either of them. Unreliability at it’s best! There are quite a few points of view, but not too many in my opinion, each served a particular purpose and were there for a specific reason, not just as filler. The characters were complex, interesting and so shady, right up my alley. Many will say this is a slow burn and I totally agree, but it’s also a slow unraveling of a tangled tale that I was never quite sure of. Not sure of who to trust, not sure what their true motivations were and definitely not sure of what would happen next. I never did figure things out ahead of time, the ending totally surprised me, completely unexpected and wholly satisfying. Sunburn in three words: Subtle, Hypnotic and Unpredictable. Do you like books that keep you up late at night because there is just NO way you can put it down until you find out the truth? What about books that are relentlessly paced with short chapters that end on mini cliffhangers leaving you reading chapter after chapter until you realize you’re finished? Or what about books that are full of thrills and excitement but also have a domestic suspense vibe chock full of secrets and lies? If you answered yes to these questions then please allow me to introduce you to the work of the fabulous Caroline Mitchell! Over the past two years she’s become one of my favorite authors, I can always count on her for an original storyline and some serious heart pounding moments and Silent Victim may be her best book yet. This is told from several viewpoints and flips between 2017, 2013 and 2002 but everything is laid out clearly, there is no confusion but just loads of intrigue. The premise of this hooked me instantly, Emma killed her teacher years ago, but she didn’t mean to and she’s been living in fear ever since. When she digs up his grave and finds it empty things start to go downhill, fast. That’s as far as I’ll be discussing the plot because this went in SO many unexpected directions that I don’t want to reveal much. The tension is insane and the guessing game was endless, I was doubtful and distrusting of everyone at some point and the ending left me gasping for breath. Another hit from one of my auto buy authors, if you haven’t read her books yet they’re all highly recommended by me. Silent Victim in three words: Nerve wracking, exciting and Menacing. I want to start by mentioning that this isn’t a traditional mystery/thriller, yes there’s definitely a mystery to be solved but if you’re looking for a book that is intense with lots of heart pounding moments it’s not this one. However, it’s extremely well written and makes for a compelling read but I think future readers should be aware that it fits better under a romantic suspense genre. There was something dark about this, a gothic feeling both in the mystery of Allison’s past, the romantic elements and the setting. The bulk of it takes place at her childhood foster home in a house on the edge of the sea in Oregon called The Dragon. There was a sinister vibe that the author created with her creepy imagery that I really liked. The romance also had a dangerous edge, it’s borderline taboo one of those that you almost feel naughty just reading about. And of course the mystery itself was intriguing and dark, there was definitely a hint of menace once all was revealed. There was quite a bit of moral ambiguity surrounding all the pieces of this one, should you make the choices that you know are right or should you go after what feels right? It deals with the gray area, there is no black or white here and gave me much to ponder which is always the sign of a well written book. Recommended for mystery fans that don’t mind romance and borderline creepy relationships. The Lucky Ones in three words: Wicked, Dark and Gloomy. Normally I fly through books at a rapid pace, devouring them in a day, (two at the most) but it took me over two weeks to read this one. It’s not what you think though. I didn’t struggle to stay engrossed, I wasn’t uninterested in the story but rather I wanted savor each page, each word of this gorgeously written book. I’ve been slowly coming out of a reading slump and this book was the one constant that I could pick up and totally lose myself in. I was almost dreading turning the final page because I wasn’t ready for it to end. This book already has close to 100,000 reviews on Goodreads so I’m sure that you’ve seen at least one before, so I’ll keep this brief. If you loved The Nightingale read this, I liked it even more and that’s one of my most loved books. If you like atmospheric stories where the setting is a character of it’s own, read this book. If you like stunning imagery, deeply developed characters and reads that will take you on an emotional rollercoaster, read the book. It will probably make you cry though so fair warning. Seriously, don’t miss this one it’s phenomenal. The Great Alone in three words: Captivating, Thought provoking and Evocative. Explores emotional danger with relentless, surgical accuracy. Tana French,New York Timesbestselling author of The TrespasserandInto the Woods. David and Caroline Connolly are swimming successfully through their marriages middle years raising two children; overseeing care for David’s ailing mother; leaning into their careers, both at David’s university teaching job, where he’s up for an important promotion, and at the ad agency where Caroline has recently returned to work after years away while the children were little. The recent stresses of home renovation and of a brief romantic betrayal (Caroline’s) are behind them. The Connollys know and care for each other deeply.Then one early fall afternoon, a student of sublime, waiflike beauty appears in David’s university office and says, I think you might be my father. And the fact of a youthful passion that David had tried to forget comes rushing back. In the person of this intriguing young woman, the Connollys may have a chance to expand who they are and how much they can love, or they may be making themselves vulnerable to menace. They face either an opportunity or a threat but which is which? What happens when their hard-won family happiness meets a hard-luck beautiful girl? Full of intrigue and incident keeps us guessing until the very last tragic page. Liz Nugent, bestselling author ofUnraveling Oliverand ofLying in Wait. Compulsively readable, with surprises until the very last page. . . . A chilling tale about a family under threat from one of its own. Jessica Treadway, author ofLacy and I Will I Know You? Imagine you’re already going through a difficult time in your marriage, a trying time that is putting your relationship to the test and then a teenaged girl shows up and announces that she’s your husbands daughter. That’s exactly what happens to Caroline and Zoe’s arrival is just the beginning of a series of events that no one saw coming, I sure didn’t! While this was most definitely a mystery, it had a strong literary feel to it, the prose used by the authors had a sophisticated subtlety to it that gave it strong edge. I’m always fascinated by writing duos, I wonder how they actually wrote the book. This is told from dual perspectives, that of David and Caroline and I pondered whether each author wrote each distinct voice, but whatever method they used it worked excellently. You would never know it’s co authored, there is nothing disjointed, it’s actually incredibly smooth and the writing style is top notch. The plot takes several unexpected turns but the twists weren’t the big, shocking gasp worthy type but rather the kind that unnerve you and get under your skin. They are still surprising, but there’s an air of refinement to how they’re executed that worked really well for me. I’m definitely a fan of the style and will be reading more from the author(s) in the future. 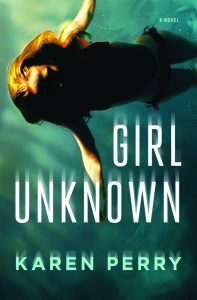 Girl Unknown in three words: Unsettling, Polished and Penetrating. Karen Perryis the pen name of Dublin-based authors Paul Perry and Karen Gillece. Together they wrote Girl Unkown. Paul Perryis the author of a number of critically acclaimed books. A recipient of the Hennessy Award for New Irish Writing, he teaches creative writing at University College, Dublin. 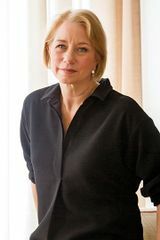 Karen Gilleceis the author of several critically acclaimed novels. In 2009 she won the European Union Prize for Literature (Ireland). Best Friends Forever was an entertaining, light mystery with chilling moments. The Reunion was a fantastic psychological thriller that delivered the promised jaw dropping twist. The Surrogate was a great audiobook and my new favorite Jensen book. Look For Her was about a cold case, one of my favorite premises! The Story of Our Lives was a lovely read about female friends with a clever structure. I think I’m finally, slowly coming out of my reading slump, which is exciting! One positive from it has been that it made me reflect and reevaluate how I want to move forward. I still love book blogging and find it to be really fun, but I realized that I’ve been putting unnecessary pressure on myself to read all of the books! Super unrealistic and silly honestly because that’s just impossible. Most of the time it’s me having FOMO, which again is just stupid so I’ve decided to be more discerning in terms of the books that I commit to reading. I cannot do it all and I want to continue to enjoy doing this and not constantly feel like I’m under pressure to read. It’s all self inflicted, no one has made me feel this way for the record. With all that said, I’ll be refraining from posting reviews on the weekends unless I have a prior commitment just so I’m not constantly writing blog posts. So no huge changes, I’ll still be around, I feel like scaling back slightly will only have a positive impact on my life! Does anyone else do this? Curious what works for you all.. And how was your week?! How well can you trust your own memory after ten years? That’s the question at the heart of this book and when I think back to a decade earlier I can’t remember all that much. I was pregnant with my first kiddo so I definitely have vivid memories of that time, but the rest of everyday life type stuff? Forget it. Kate can’t forget the week she spent in France with her five closest university friends, there was drama, turmoil and a neighbor went missing. But now her body has been discovered and the investigation has been reopened forcing Kate to recall painful memories that she would rather be left in the past. How well can she trust herself, they were drinking and again, it’s been ten years! I loved the unreliability this provided as everyone’s perception of that week didn’t quite fit together making it tricky to piece together the truth. This is a slower paced novel, you should definitely be in the mood for a lighter mystery that doesn’t rely on crazy plot twists when you pick this up and I do recommend picking it up! Despite the leisurely pace I was hooked almost instantly, there were fantastic moments of doubt and plenty of evasion from the core group of friends that kept me entertained. What sets this apart is the deep characterization coupled with a strong writing style that gave me shades of Ruth Ware. I’ll definitely be eagerly awaiting her next book! The French Girl in three words: Perceptive, Enigmatic and Dubious.